LDX3840.2160_650_600_B300 model that we offer is a high resolution extra-large display unit that provides crystal clear images. Our LDX3840.2160_650_600_B300 LCD is developed to meet the demands for extra-large size LCD With extra high resolution (3840X2160) by field battle command system such as vehicular command post and mobile command post. It can process display signals such as VGA, PAL, S-VIDEO and DVI. It can achieve extra high bandwidth and extra high resolution display as well as four pictures seamless display. Besides, our LDX3840.2160_650_600_B300 model supports multi-point touch function. 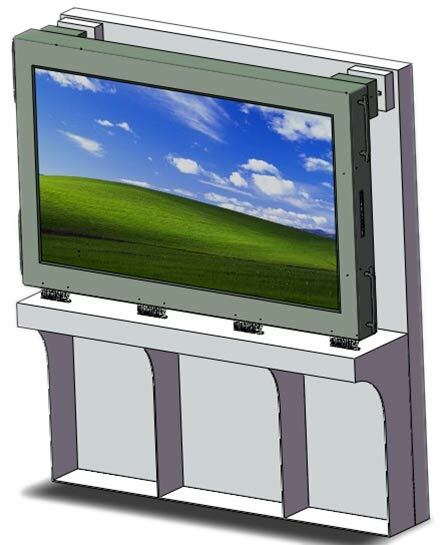 It greatly enhances the anti-harsh environment capability and reliability indexes of extra-large size and extra high resolution LCD panel in vehicular condition. It further improves Graphics video processing and video logic control technology. The product is mainly used in field battle command system such as vehicular command post and mobile command post to display countless information including battlefield situations, electronic map, and target property and also to assist command personnel in analyzing and making quick decisions according to the provided information.